This passionate display is sure to light a fire in someone's heart! Stunning Gerbera daisies, roses, and poppies in shades of deep, flaming red are accentuated to perfection with a single dazzling white Asiatic lily and complemented by a background of vibrant green. 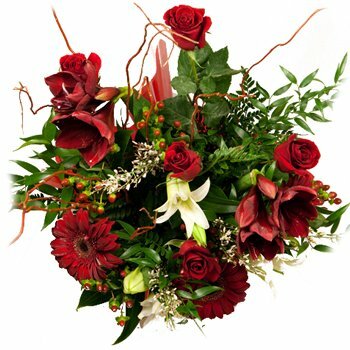 Make his heart miss a beat, or show her how your heart beats for her when you send the Flames of Passion Bouquet for Valentine's Day, anniversaries, birthdays, or any romantic occasion.